God loves to hear children sing, and this CD helps you do just that. Join Happy Mouse as he leads the sing-along in 13 different songs. Each song is followed by a short Bible story. Ages 3-8. 16 - Who Built The Ark? 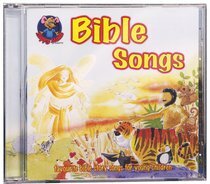 About "Bible Songs (Happy Mouse Presents Series)"
No one livens up children's Praise %26 Worship times like the ever-popular Happy Mouse! Here is a whole stack of all-time favourite children's songs, providing lots of Scripture-focused fun. Perfect for Sunday School, Kids' Club, at home, in the car - in fact, wherever kids are! Music Manager's View: Happy Mouse is one of today's best-loved children's praise series, with Jesus Loves Me Volume 1 being the clear stand-out so far. I believe Volume 2 is set to equal or even exceed the popularity of its forerunner. Kids will totally love these catchy, sing-along tracks. Check them out at our web store!